William Kelly was the candidate of the majority faction of the Democratic Party which supported Stephen A. Douglas for President. The "Breckinridge and Lane Democratic" state convention met on August 8 at Syracuse, New York, Henry S. Randall presided. James T. Brady (a Tammany man from New York City who had run for Attorney General on the Hard ticket in 1853) was nominated for Governor on the first ballot (vote:Brady 99, O'Connor 8, Greene C. Bronson 3, Brown 2, Lawrence 1, Kemble 1, Gideon J. Tucker 1). Henry K. Viele was nominated on the first ballot (vote: Viele 57, Edward Tompkins 56). The incumbent John M. Jaycox was re-nominated for Canal Commissioner by acclamation. Robert W. Allen was nominated for Prison Inspector on the first ballot. After the nominations, Daniel S. Dickinson made a speech. Brady accepted the nomination in a letter dated on August 14. 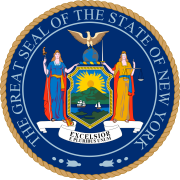 93 Republicans and 35 Democrats were elected for the session of 1861 to the New York State Assembly.